Do You Wanna be Strong? When I was a kid, my Dad would wake me up each Saturday at about 7:00 am with this question: “Hey Dude, you wanna be strong?” Don’t check out just yet. This post has NOTHING to do with fitness. Dad’s question was not a question. It was more like a directive. A directive that gave considerable importance to taking the hand-held grass trimmers (see pic above) and trim around the house and then the church before taking over from him behind the mower. Dad never saw a Saturday as a day to chill and rest. He saw Saturday as a list of tasks to attack like D-Day. Clearly, Dad had no appreciation for the fact that, at that time, cartoons could only be seen before Saturday at noon. Can you imagine? No cable, no DVR, no internet. I just wanted to watch cartoons! That was not included in Dad’s plan of attack. 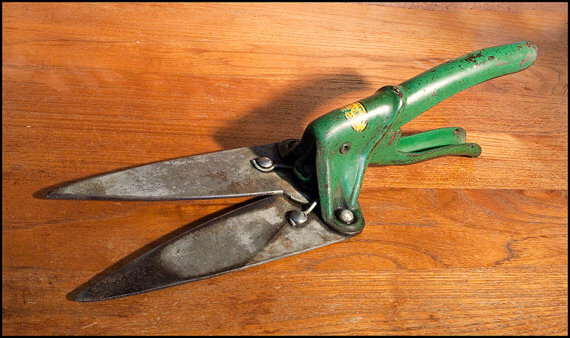 So, I would first sharpen to blades on these overgrown scissors, then crawl around our house first, clipping any grass that the mower wouldn’t cut. Then crawl around the church buildings and do the same. At the time, I hated it. I saw it as some evil conspiracy against kids of Pastors. And my Dad was a volunteer pastor for goodness sake! I look back on it now and have three excellent thoughts from my remembrance of the Saturday Morning death march. I am so grateful that somebody invented weedeaters. Those old shears were brutal, time-consuming tools of torture. I would have placed them in the category of Weapons of Mass Destruction. I am so grateful that my Dad got me up and taught me the value of working hard. As I grew older, Dad would say, “Dude, there will always be work for a man that knows how to work.” He taught me how to frame a house, wire a light fixture, paint a corner and build a sermon. He taught me how to officiate a funeral and a wedding. And he taught me how to get up and do something! I am so grateful that Dad made certain that I learned the value of earning a wage and not feeling entitled to anything. Somewhere along the way, we Americans lost the value of actually working with our hands. I trust that in the years ahead, I’ll have the privilege of teaching many of Dad’s lessons to my grandkids. It has served me well, and it will serve them well, also. Easier and out-sourced are not always better.